ALL GONE! SOG Knife Rights 2018 Limited Edition "Stars & Stripes" Ultra C-TI Arc-Lock Folder: $134 Retail Value Without Engraving - FREE* to $200 Donors - ALL GONE! This SOG Knife Rights 2018 Limited Edition "Stars & Stripes" Ultra C-TI Arc-Lock Folder features unique laser engraving. On the front against the stars and stripes is the Knife Rights Sharper Future™ logo. On the the back side is our acclaimed "All Knives Matter!®" trademark. 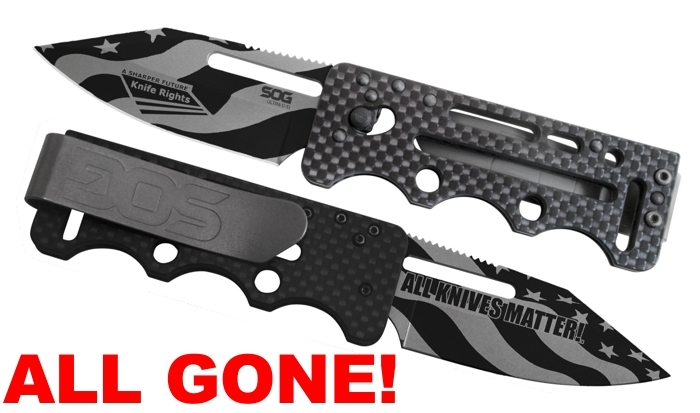 Generously donated by SOG Specialty Knives & Tools - Retail Value without engraving: $134 - ALL GONE! ARC-LOCK™: The Arc-Lock might just be the perfect lock. STRENGTH: Tested at over 1000 lbs. of force (measured at the lock), far surpassing conventional lock strength. SPEED: Lightning-quick, one-handed opening and closing capability. SAFETY: Spring-action securely retains blade closed, keeping fingers safely clear while unlocking. DURABILITY: Self-adjusting over time and easily cleaned for long-term optimal performance. Our story begins in Vietnam, where members of a highly classified US special ops unit – known as MACV-SOG – carried a unique combat knife into the jungle on covert missions. Years later, in 1986, that knife inspired a young designer, named Spencer Frazer, to found SOG Specialty Knives. His mission: to reproduce the original SOG Bowie knife and pay tribute to the special ops unit that created it. What began as a single commemorative model soon became a full line of innovative tools – field-proven by US Special Forces, even honored as the Navy SEAL knife of choice. Today, SOG knives are carried with confidence into the most demanding situations. Forged out of tradition, hardened in the field, honed for you.